While always at risk of being corrupted by pride or an intellectual substitute for faith, the study of theology matters because, at its best, it is the intellectual expression of the love of God. 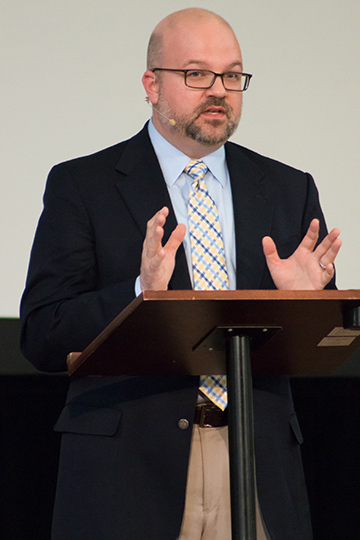 “Real love craves deeper knowledge,” Cameron Jorgensen, assistant professor of Christian Theology at Campbell University Divinity School, told students in one of four Auchmuty Lectures hosted by Samford University. “That’s why theology matters,” he said. “If one abandons the intellectual love of God, all that remains are fleeting feelings, vague conviction, and nondescript activism. Christianity is not a system of theology, rather a way of life, Jorgensen maintained. The discipline of study protects and guides the practice so that its true purpose — genuine contemplation of God — is maintained. Jorgensen cited early founders, such as St. Anselman of Canterbury and Justin Martyr, whose study of philosophy led to an acceptance of the Christian faith as the faithful way to Jesus Christ. “I find it fascinating that ancient philosophers were well aware that the human desire for knowledge can become corrupted,” he said. “Anyone who uses Facebook, Twitter, Instagram or SnapChat knows this is the case. Harnessing our attention and regulating our desire to know may be the moral issues of the information age. In his closing lecture, primarily addressed to the Auchmuty Lectures committee, Jorgensen urged ways that ministers might recapture a vision of Christianity as a way of life where earnest seekers, like Justin Martyr, can discover a living truth. “Thinking of the faith as bios is not only more attractive to a culture that offers a cacophony of competing claims, but it is also more faithful to the way of Jesus Christ,” he said. The Auchmuty Lectures were established in 2004 by Shades Crest Baptist Church in partnership with Samford’s Center for Congregational Resources. It honors retired former pastor James A. Auchmuty, a Samford alumnus. The center sponsors lectures, seminars, workshops, and sabbaticals and study leaves for pastors and congregation leaders.